It is believed the Wallace family originated from Ness, a tiny village on the border of England and Wales, they were of the original Celtic stock of that area. They were vassals of the powerful Fitz-Alan family, a family that had arrived in England at the time of the Norman conquest of England in 1066. They were large land owners in the Oswestry area, an area that was sometimes under English control, sometimes Welsh. When David I was King of Scots, he invited some of the Norman families that had settled in England north. He bestowed offices upon them, as he was impressed by the organisational skills and martial abilities of these Normans. The Fitz-Alans were given land in the Renfrew/Paisley area, and were given the title High Stewards of Scotland (Steward was to be corrupted to "Stewart" over the years, and marriage to blood royal would mean that the Stewarts were to eventually be the ruling dynasty in Scotland, and later in England too). They built their castle at Renfrew on the River Clyde, and parcelled out the land to their followers. The family from Ness were settled in the Elderslie area, just west of Paisley. As Ness meant nothing to the local population, they began to call them "Wallace" - the old Scots word for people of Welsh stock. Several generations on, William was born, most likely at the family's fortified site at Elderslie, today marked by a memorial, although the family owned another small estate at Auchenbothie, a few miles away, near Howwood. We know very little factual detail about William's early years, but we do know he had an elder brother named Malcolm, and a younger named John. His father's name was Alan. There have been claims over the years that William was from Ayrshire, but these claims can easily be disproved. There has been much misinformation peddled about over the last century or so regarding William's place of birth, and this should be ignored. In a similar vein, it is often stated that William's father's name was Malcolm - the same as his elder brother, but this is also fabrication. The seal on a surviving letter of William's, the Lubeck letter, states, "William filius Alan" - William son of Alan. One of the oldest works of literature in Scotland is a book entitled "The Deeds of Sir William Wallace of Elderslie" by Blind Harry. Blind Harry was a wandering minstrel in Scotland in the 1400's, and he told tales of William Wallace on his journeyings around Scotland. This book is the second biggest selling book ever in Scotland, outsold only by the Bible. This work gives us much detail of Wallace's early life, but as there is no other source to back any of the tales up, it must be looked at critically from an academic viewpoint. It was Blind Harry's work that was used as the basis for the motion picture "Braveheart" - it is still in print, but it is in the form of an epic poem and may seem dated to modern sensibilities. 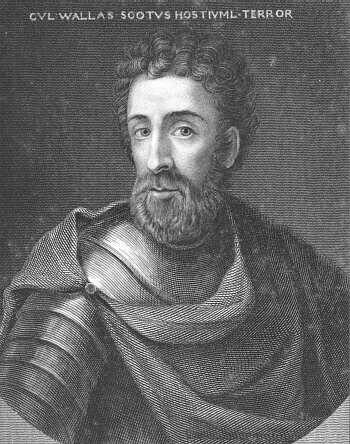 William Wallace jumps onto the pages of our history books in 1297, when he stabs the English governor of Lanark to death. It is said this was in retaliation for the slaying of his sweetheart. We do not know the exact year of William s birth, but educated guesses put it between 1270 and 1275, so he was still a young man. 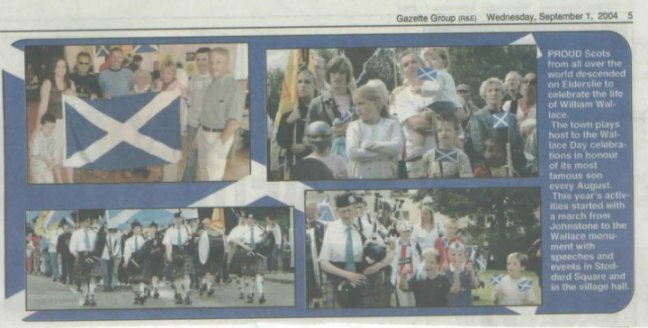 From this point on, young men in Scotland, dismayed at the English occupation of their native soil, flock to join Wallace's banner. By mid 1297, Wallace has a rag tag army. He joins forces with Andrew Murray,(sometimes spelt Moray, but the pronunciation is Murray) a young man who has started a similar rising in the north of Scotland. While these two are besieging the castle of Dundee, word comes that the English have sent a great army against them. The two armies come to battle at the bridge over the River Forth at Stirling on September 11, 1297. Wallace's base at this battle was a huge rocky outcrop named the Abbey Craig, so called because of its proximity to Cambuskenneth Abbey, and today this rock is crowned by The National Wallace Monument, a 220ft tower celebrating the life of Wallace, and containing as its prime exhibit what is believed to be the sword of our hero. The Scots routed the English with much slaughter, but unfortunately Murray received wounds which were to prove fatal, and he was taken north to Fortrose Cathedral to be buried. 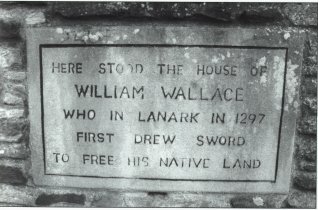 The Scots went on to invade northern England to bring back much needed supplies, and on return from this invasion Wallace was made "Guardian of Scotland" at the Kirk of the Forest, the remains of which stand in the town of Selkirk. 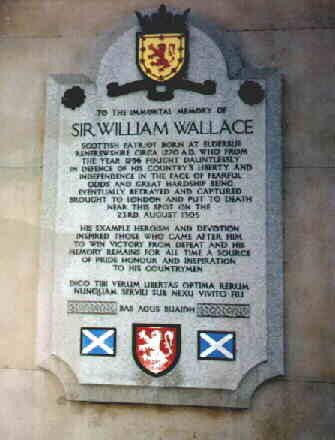 He was also knighted, as from this time on he is referred to as "Sir" William Wallace. The English king, Edward I, commonly known as "Longshanks" returned from his continental wars, and gathered another great army and marched north to deal with Wallace. These two armies came face to face at Falkirk in July 1298, and this time the English longbow was to prove the undoing of the Scots spearmen. The Scots fled, and Wallace resigned the guardianship, preferring to fight the overwhelming might of England with guerrilla tactics. In late 1299, Wallace decided to travel abroad and try and enlist foreign help. He travelled to France, and to Rome, hoping that the Pope would exert influence to try and curtail English deprivations in Scotland. He returned to Scotland in 1303, only to find that the English had tightened their grip and that he must start from scratch to try and regain his countries liberty. The fight back began, but the odds were very much stacked against him. 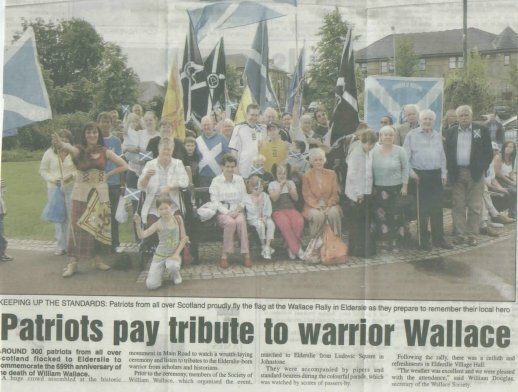 Wallace was eventually betrayed and captured at Robroyston near Glasgow, on 3rd August 1305. He was taken first to Dumbarton Castle, where his sword was left behind, then he was taken south to London. He arrived in London on the 22nd August. The crowds were so great, so eager to see this Scottish "murderer", that he had to be kept the night in a house in Fenchurch Street. The next morning he was taken to Westminster Hall, the oldest part of the Houses of Parliament, where his sham trial took place. He was allowed no defence, but he managed to shout above his accusers that he was "A Scot, born in Scotland, and did not recognise England as his sovereign nation" He was tied to the tails of horses, and dragged through the streets of London for 6 miles, eventually arriving at Smithfield Elms. Here he was hung, then cut down while still alive. His stomach was opened and his entrails were pulled out and burnt before him. His heart was then ripped out, ending his life. His body was cut to pieces, his head stuck on a spike on old London Bridge. The parts of his body were sent north to dishonour the Scots. Longshanks thought by giving him such an ignoble death that the Scots would forget Wallace, and there were religious connotations too. Wallace would have no body to rise on Judgement Day, and so be damned forever. But Sir William Wallace needs no tomb. His memory lives on in the heart and souls of Scots, every generation recognising his devotion to his native soil, and he will be remembered by Scots men and women till the end of time.